Valencia turned up the heat on Atletico Madrid in the fight for third place in La Liga when a 3-0 derby victory at home to Levante on Monday lifted the Singapore-owned club to within a point of the champions with seven games left. 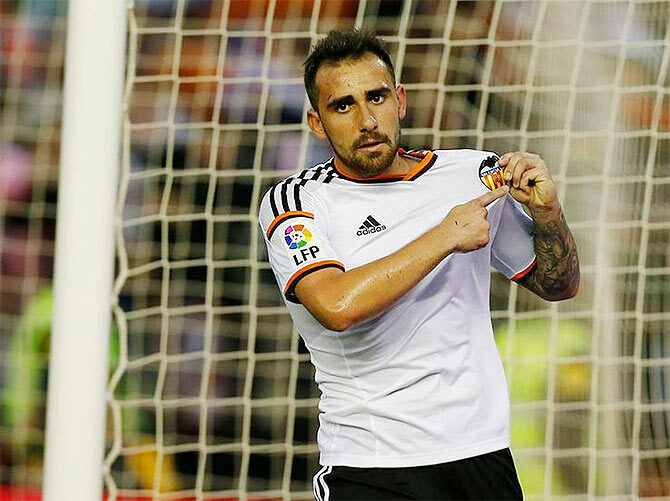 Paco Alcacer nodded Valencia in front from a Dani Parejo centre in the 16th minute at the Mestalla before Lucas Orban crossed for Sofiane Feghouli to head a second for the home side nine minutes before the break. Substitute Alvaro Negredo completed a resounding victory when he crashed a shot into the top corner in the third minute of added time. Valencia, who missed out on a place in continental competition last season, are fourth on 65 points, with Atletico, who drew 2-2 at Malaga on Saturday, on 66 in third. Feghouli told Spanish television Valencia, who play at leaders Barcelona on Saturday, had been itching to get back to winning ways after consecutive draws against Villarreal and Athletic Bilbao. "I think we controlled the game pretty well against a team who sits back and defends and we tried to attack down the wings," added the Algeria forward. "We are going to try make things difficult for Barca and all we are thinking about is winning the next game." Barca lead on 75 points after they squandered a 2-0 lead and drew 2-2 at fifth-placed Sevilla on Saturday, two ahead of second-placed Real Madrid, 3-0 winners at home to Eibar. The top three places carry a berth in the Champions League group stage, while fourth earns a spot in qualifying for Europe's elite club competition. Valencia last won La Liga in 2004 under Rafa Benitez and backed by a new owner, Singapore billionaire Peter Lim, current coach Nuno has begun the process of turning the club back into contenders in Spain and Europe. They reached the Champions League final in 2000 and 2001, losing to Real Madrid and Bayern Munich respectively, but subsequent financial problems forced them to cash in on top players, including David Villa, David Silva and Juan Mata.